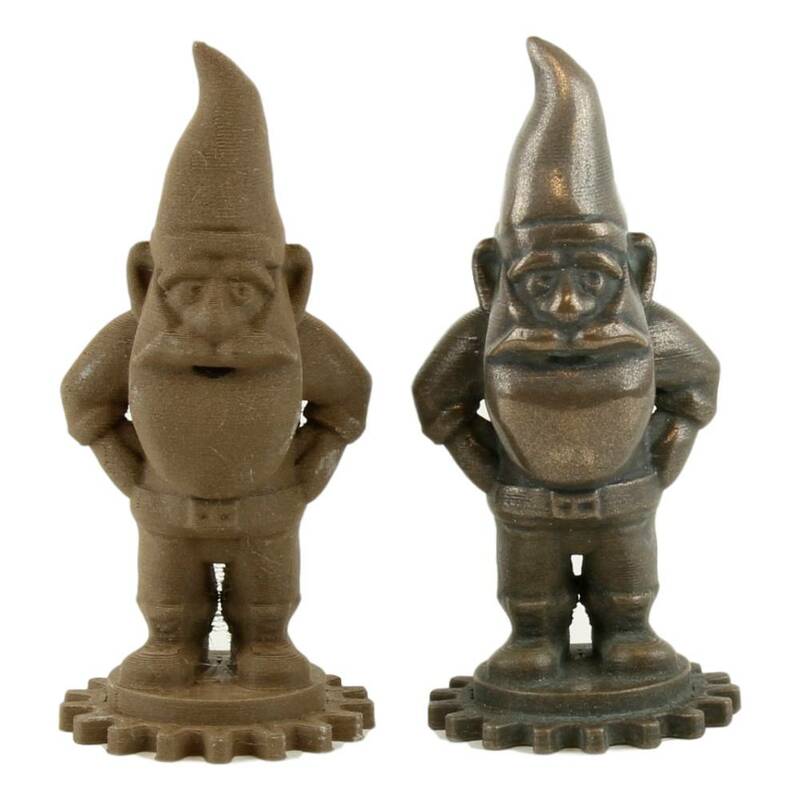 New Bronze Metal HTPLA: prints like plastic, but finishes like real metal for beautiful, durable parts from most standard 3D printers. So many finishing possibilities with different techniques! 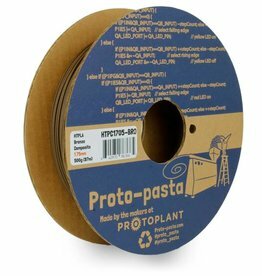 Composite HTPLA filament with bronze powder. 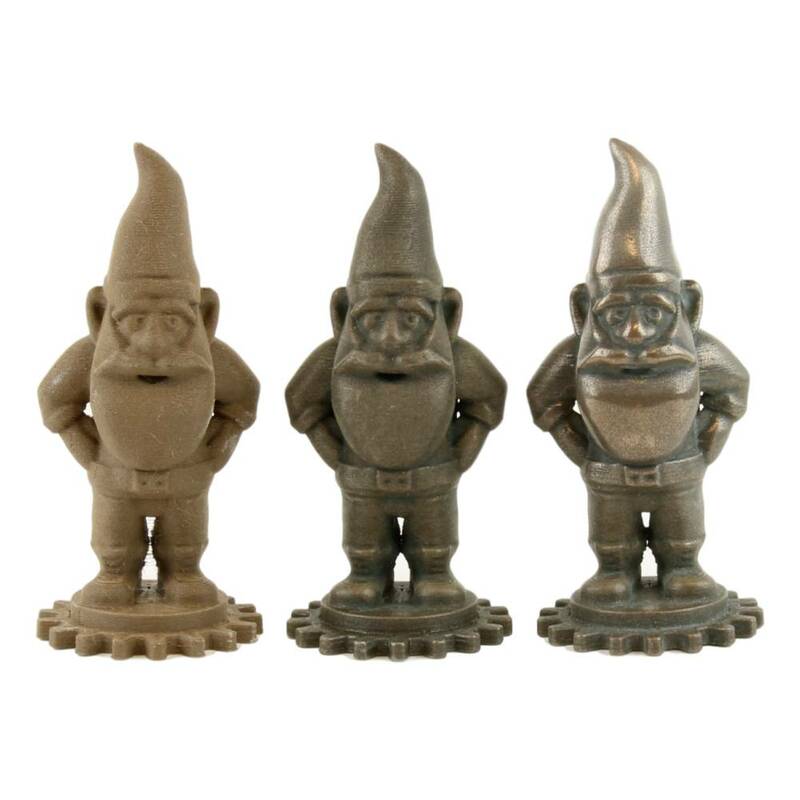 Bronze can be abrasive, you can use a standard nozzle or a wear resistant nozzle for extended use. 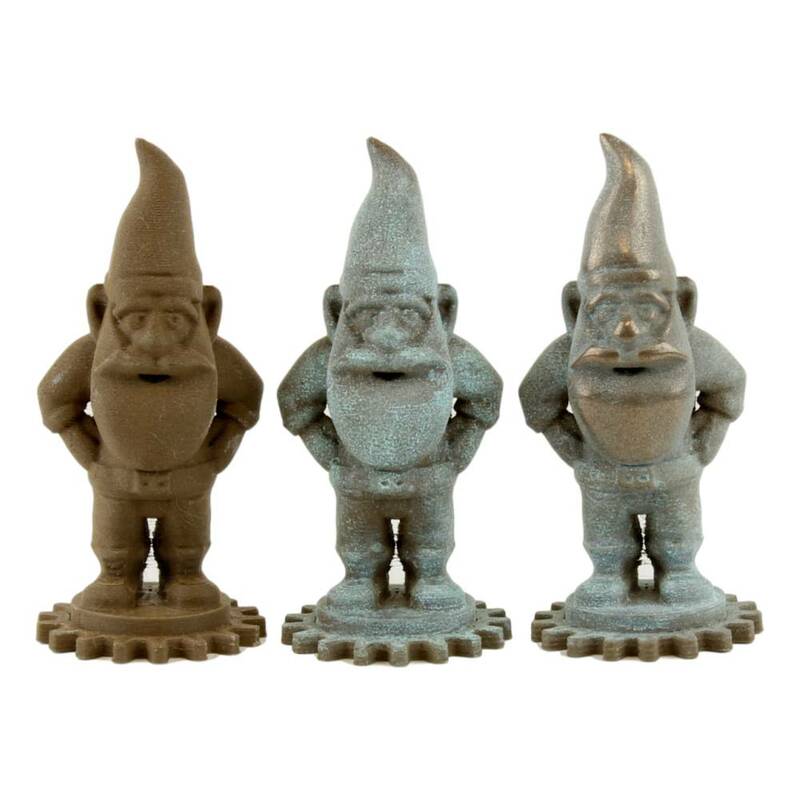 A 0.6 mm nozzle or larger is preferred, but you can print also with a 0.4 mm nozzle. There is not enough metal to be electrically conductive, sintered, or plated, but there is a noticeable difference in weight and heat transfer compared to a standard PLA. Many finishing: brush, polish or patina! Patina (oxidize): exposed metal naturally or accelerate with a 50/50 vinegar/hydrogen peroxide mixture saturated with salt. Place in sealed plastic bag to retain moisture. Heat further accelerates reaction. 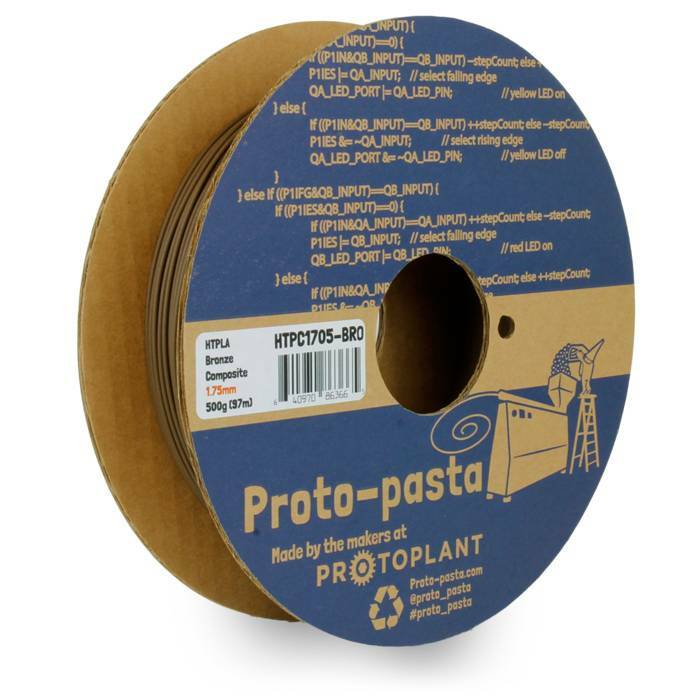 Bronze Metal HTPLA can print at 185-215 °C, hottest on first layer for best adhesion. Heated bed is not required, but if available set it from 0 to 60 °C max (over 60 °C can worsen warp). Recommended print speed: 20-80 mm/s. Standard build surface preparation like blue tape or glue stick work best along with slow (10-20 mm/s) and hot first layer for best adhesion. For a balance among quality, reliability, and productivity a layer thickness of 0.15-0.20mm is recommended. This material has been flow optimized and has less moisture uptake than standard PLAs, however composites are still sometimes more tricky to print depending on hardware and software settings. The main challenge is to keep mass flow up (larger nozzle + fast speed) and in a single direction (minimal retraction) to avoid heat soak. In as little as 5-10 minutes for small, thin parts and as much a few hours for massive parts, HTPLA parts crystallize in an oven at 110C +/- 10 °C to become more stiff. We recommend leaving the supports on your parts, placing them on a non-radiating surface (like glass, ceramic, or composite), and letting them cool in the oven to minimize distortion. Parts can be baked at a lower temperature (though must be above 60 °C for any change to occur) for a longer time with less risk of unwanted deformation. Best results are with flat and/or supported parts with 100% infill. In this instance we experienced x/y shrinkage of 1.5% and z growth of 1%. These are only indicative parameters, which may vary depending on the type of specific print and process.